This blog post was originally published on January 8, 2014. By the 1930s, the vast majority of American urban dwellers had access to electricity in their homes and businesses. But those in impoverished rural areas were often not serviced by private electric companies, who believed that it was not cost-effective for them to invest in extending power lines into areas of the country that would generate only a handful of new customers. As part of President Franklin Delano Roosevelt’s New Deal, the Rural Electification Adminstration (REA) sought a way to provide rural residents, primarily farmers, with access to electricity. The private power companies argued that the government could not compete with private enterprise by providing electricity directly to consumers, so instead the REA offered loans to local electric cooperatives, which in turn installed power lines and distributed electricity to the rural population. Lester Beall was already a successful graphic designer when he was commissioned by the REA in 1937 to produce a series of posters that would increase awareness among the rural population about the benefits of electricity. Beall employed a simple, patriotic color scheme of red, white, blue, and black and used bold, stripped down imagery (a light bulb, a farmhouse, a faucet) with arrows to suggest the flow of electricity. The REA found the posters so successful that they commissioned Beall to create two additional series of posters in the subsequent years. For the second series, Beall employed the increasingly popular technique of photomontage, integrating photographically sourced imagery with flat planes of color and humorous slogans. Beneath the printed phrase “When I Think Back,” for example, an older man in a rocking chair turns on his radio, while red arrows signal the invisible electric current. In the third series, for which the poster depicted above was designed, Beall utilized photographic imagery entirely to set the scene. Here a woman in an apron stands poised over her oven, pulling out a perfect tray of biscuits while pots of food cook atop the stove. Absent is the mess of coal, wood, or oil. Electricity is no longer signified by power lines or arrows, but by the dominant pattern of red dots that suggest the flow of electric current and the heat it generates (and nicely mimic the polka dots of the woman’s apron and dress). 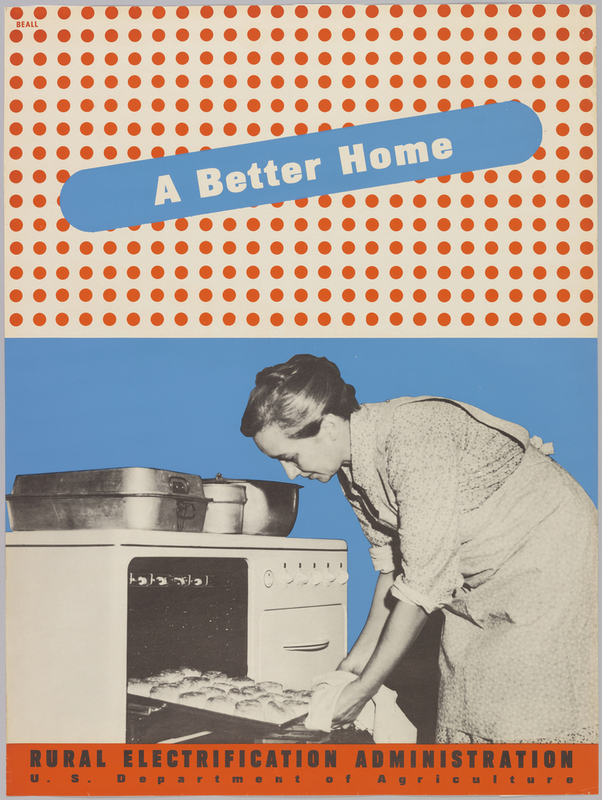 With his slogan “A Better Home,” Beall’s message was clear: electricity will improve your kitchen, which will improve your home. And besides, who can resist a tray of biscuits? Caitlin Condell is the Associate Curator and Head of Drawings, Prints and Graphic Design at Cooper Hewitt, Smithsonian Design Museum. Ironic that the cities who were all piped for gas at this time did NOT opt for cooking on electric and we are now stuck with an aesthetic for cooking on flame, something that requires fracking in order to get that gas. Too bad we did not have URBAN electrification!